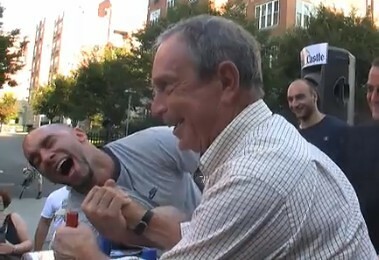 Notice Michael Bloomberg shnoogling into the picture. Hats off to sports reporter Kenny Albert — he didn’t give Bloomberg a chance to cop some of the glory. He’s one of the few media people who hasn’t gone into the tank for Michael Bloomberg. We hope his job is safe. Mayor Bloomberg held his position on the podium, so long that it almost seemed awkward. Sunday night’s TV MVP, though, is Fox’s Kenny Albert, who showed up in the winning clubhouse after having called the Vikings-Steelers game earlier in the day. Then he kept his focus on relevant interview subjects – i.e. people who play for the Yankees – while ignoring mayor Michael Bloomberg, who hovered for several minutes, seemingly hoping Albert would ask him something – anything! – before Election Day. Mayor Michael Bloomberg refused to attend a scheduled candidate forum about HIV/AIDS or even fill out a questionnaire to discuss his positions on HIV/AIDS. But that didn’t mean AIDSVote would sit this election out. AIDS advocates and Democratic Mayoral candidate New York City Comptroller Bill Thompson came to Bloomberg, rallying outside Bloomberg’s campaign headquarters, in protest of Bloomberg’s refusal to state his positions on an array of pressing AIDS issues before the upcoming November election. “He ignored our questionnaire! This mayor is not fair!” advocates chanted, holding signs of Bloomberg that read, “AIDS needs answers.” The rally was organized by Housing Works and Women’s HIV Collaborative, in collaboration with AIDSVote. Thompson agreed to participate in the debate and filled out the candidate questionnaire, available at AIDSVote.org. In his questionnaire, Thompson said he supports expanding housing opportunities for people living with HIV and reopening the Mayor’s Office of AIDS Policy, which was eliminated under Bloomberg. Bloomberg’s campaign cited a “scheduling conflict” for why he couldn’t attend tomorrow’s forum, and said the Mayor only fills out candidate questionnaires if there is the possibility he would be endorsed afterwards—something the nonprofit AIDSVote coalition is legally unable to do. “I guess Bloomberg thought he doesn’t need support of nonprofits, since he can buy their votes,” said Housing Works President and CEO Charles King, citing the millions of dollars Bloomberg has donated to not-for-profit organizations. “But at Housing Works, we tend to not be afraid of mayors.” The Mayor was also invited to attend the rally, but declined that invitation as well. In fact, many other AIDS groups that were originally scheduled to participate in the AIDSVote forum backed out, citing a perceived conflict of interest. But Women’s HIV Collaborative Executive Director Pei Desrosiers said this election was too important to ignore. “HIV is a human rights issue. We can’t afford to have the next mayor continue to underfund AIDS in this city,” she said. AIDS groups are particularly angry with the Mayor for failing to reform the City’s backward policy of letting people fall seriously ill before they qualify for AIDS housing. Legislation called HASA for All that would provide housing to all homeless New Yorkers living with HIV is before the City Council. The AIDSVote questionnaire seeks answers from Bloomberg on a number of other issues including helping illegal immigrants access AIDS treatment and care, HIV prevention in prison’s and the city’s reliance on substandard SRO hotels to house homeless New Yorkers living with HIV/AIDS. The overall direction of the city’s approach to AIDS is also at stake in this year’s Mayoral election. Bloomberg put the coordination of many of the City’s AIDS services under the Department of Health, a move that has interfered with the ability of commissioners involved in AIDS policy to work together. Housing Works and other AIDS groups are pushing for the reestablishment of the Mayor’s Office of AIDS Policy, which would re-establish effective coordination, as well as allow the City’s Ryan White Planning Council, which influences the spending of more than $100 million in federal money, to operate more independently of DOH influence. Its this past Sunday in Union Square in NYC as I shake hands with New York’s Mayor Mike Bloomberg. Searching for Martin’s Pretzels at the farmers market as recommended by a Toastmasters friend, I came across a Bloomberg supporter handing out fliers. 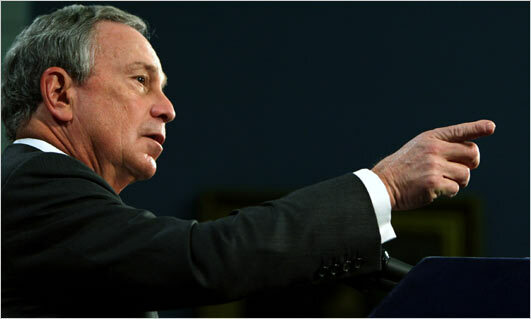 Bloomberg spent two terms (8 years) in office and recently had city council change the rules so he could run for a 3rd term. “What’s Bloomberg going to do in the next 4 years that he couldn’t accomplish in the past 8?” I asked. “He’s right over there, ask him yourself” the supporter told me. His responded by shrugging his shoulders, giving me a quizzical look, and walking away. His face read: I did it because I can. Mike Bloomberg is worth $17.5 billion dollars, the country’s 8th richest man: He must know something. * City Room says the mayor’s race is all about education today. * Queens Crap has part five of the Bloomberg: He’s Just Like One of Us series. Mayor Michael Bloomberg announced that he is in negotiations with city council speaker Christine Quinn over the price that he and a small group of friends and associates will pay for naming rights to various public places. Fifth Avenue to be renamed Bloomberg Way; Lexington Avenue from 23rd Street to 96th Street to be renamed Avenue of the Roses after the Rose family, prominent philanthropists; Houston Street between the East River Drive and West Street to be renamed Stern Street, after Leonard Stern, who ranks 97th on the Forbes 400 list; First Avenue to be renamed Speyer Avenue for Jerry Speyer who purchased Stuyvesant Town and Peter Cooper Village, the largest real estate deal in New York history. Speyer ranks 227 on the Forbes list. He is said to be worth $2 billion. Tishman Speyer, the firm that holds title to the properties that border on First Avenue has been unable to evict as many rent-regulated tenants as his business plan called for and the property is in litigation over a J-51 tax abatement. Speyer is said to be considering dropping out of the negotiations should he lose the lawsuit. Additional public spaces under consideration include Flatbush Avenue, Brooklyn’s main thoroughfare, which is said to be the subject of a spirited bidding war between Bruce Ratner and Harry Macklowe whose roots are sunk deeply in the borough’s history. Macklowe, who was once 239th on the Forbes list is unranked this year following his financial difficulties with the General Motors Building. He became notorious when, he ordered the “midnight demolition” in 1985 of four S.R.O. buildings on W. 44th St. The infamous demolition was done without a permit at a time when developers were harassing low-income tenants out of single-room-occupancy buildings. Other sites on the naming block are rumored to be Central Park’s Sheep Meadow, which Donald Trump is said to be interested in as a naming opportunity in honor of his father, Fred, a residential developer who got his start in Brooklyn. “Fred’s Meadow,” said a close Trump associate has a nice resonance to it. Union Square is being eyed by the LeFrak family. But there is said to be resistance to it in light of the fact that certain portions of the park have been given over to a restaurant developer whose contract requires his approval for any further conveyances of property rights to the park. The idea for naming streets, parks, and other public places in exchange for cash, stems from the historic water fountain in Washington Square Park, which is now officially named the Tisch Fountain. The Tisch family is a prominent real estate dynasty, long associated with New York University, whose properties border the park and in fact have in the past taken parts of it. The deal to rename the century old fountain, which was unnamed for a hundred years was closed for $2.5 million in a secret transaction between the Parks Department and the Tisch Foundation in January 2005. Parks Commissioner Adrian Benepe allegedly withheld this information from Community Board 2, the New York City Council and the Landmarks Preservation Commission. It was revealed only after a community activist filed a Freedom of Information Letter (FOIL) Request that the public learned of the deal. Michael Bloomberg said that “my administration is the most transparent government in New York City history and I resent the implication that we do anything in secret. It is a disgrace to suggest otherwise. In transactions such as these, however, when negotiations are delicate, the public’s right to know must be balanced with the need to raise revenue from private sources. We have a vast untapped resource in naming rights that could be worth hundreds of millions of dollars or even billions, and I see nothing wrong with waiting until the deal has been closed and the new street signs have arrived before holding a press conference to announce these changes. It will maximize our profits and the buyers have rights too. Many are jeolous of their privacy and we must respect that. Everything we do has been checked carefully by our corporation counsel and I can assure the public it’s all legal. We have dotted every I and crossed every T.